What War did your Ancestors Serve in? As the calendar rolls towards Memorial Day, or Veteran’s Day, genealogists begin to wonder what wars their ancestors served in. You might have photos or other mementos from relatives that make it clear exactly which war they served in. Sometimes things aren’t so obvious. Fortunately, Fold3 has created a handy info-graphic that can help genealogists figure out which war their American ancestors most likely served in. Fold3 is part of Ancestry.com. This would explain why the helpful info-graphic from Fold3 appears in the Ancestry.com blog. 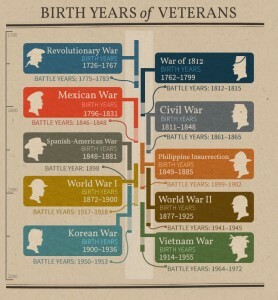 It is a chart called “Birth Years of Veterans”. 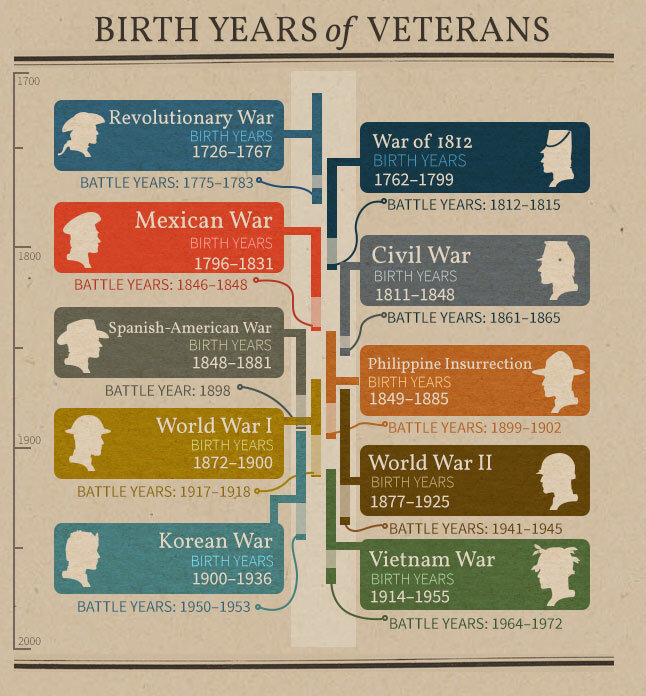 It very clearly shows what the birth years were for the people who served in 10 different wars. (Take a quick visit to the Ancestry.com blog if you want to see the info-graphic and save it to your desktop). How can genealogists use this information? First, you need to know the birth year of a particular ancestor. Once you know the year he was born, you can match it up to a particular war. This can give you clues about where to start searching for that ancestor’s military records. For example, if your ancestor was born in 1730, you should seek out military records that correspond with the Revolutionary War. That’s a fairly straightforward example. Other situations could be somewhat trickier to figure out. Let’s say your ancestor was born in 1848. He might have served in either the Civil War or the Spanish-American War. The birth dates listed for each war are the average range. It is possible that an ancestor who achieved a high rank in the military could, potentially, have served in a war other than the one that matches the chart. He could be older than the soldiers he served with. The same is true the other way around. There were some soldiers who were too young to join the military, but who did so anyway. They simply lied about their age. It wouldn’t work today, but did work for at least some soldiers back in the days before the driver’s license was used as an official form of identification. Image by Walter on Flickr.